MADRID (Reuters) - Sabadell <SABE.MC> wants its British unit TSB to start buying other businesses once it has cleared up the fallout from an IT meltdown, a spokesman for the Spanish group said on Friday. Chairman Josep Oliu had said on Thursday Sabadell would in January present a plan to turn around TSB, which suffered a technology failure this year that will cost it some 320 million euros (285.16 million pounds). 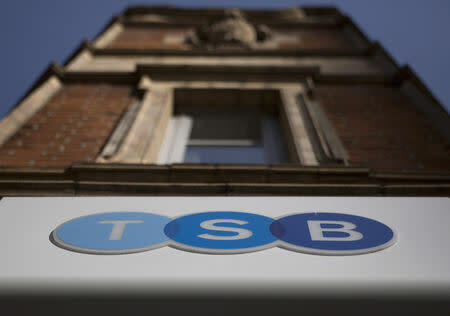 "The aim is that TSB enters into a process of consolidation in the future in Britain," Oliu said at an event in New York. "We will need at least two years for this. Afterwards we will enter into the consolidation process." His words prompted speculation Sabadell could look to sell TSB, whose chief executive Paul Pester resigned after a botched system switch locked nearly two million customers out of online banking services and led to a surge in fraud. But a spokesman denied any plan to sell TSB, saying instead Sabadell wanted to beef it up by buying other assets, adding that the British unit was Sabadell's "reason for being". "Once we have got past the IT problems, our priority is to deploy more modern and efficient platforms in Britain, to be an important player in the small and medium-sized business market," the spokesman said. Shares in Sabadell were trading 0.6 percent higher at 1054 GMT compared with a 1.1 percent rise in Spain's IBEX index.